- Approximately 30 inches in height. - Approximately 22 inches in width. - Approximately 20 inches in depth. 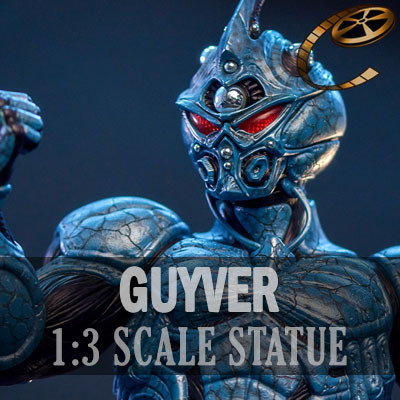 - Old-school hand-painted pattern on entire Guyver Armor. - Attractively themed "The Unit" display base with breathing LED light. - Special 3D eyes with light-up function. - 2 pairs of real - Each Certificate of Authenticity is signed by Steve Wang. - Limited in production to 299 units worldwide.